It'd be nice, for skin, being able to save some of the fiddly details I've done while able to ctrl-apply it so that the maps are something else. Similar for hair -- don't touch the maps, just change all the other stuff. I ignored refraction -- I found it made the hair too transparent. Also 0 translucence and SSS, for same reason. My original attempts used WAY too much displacement and it looked like she smeared mud through her hair. These settings appear to have completely fixed all the hair problems I was having. I actually made myself a little preset shader with these values - I still have to go in and add the diffuse, bump and opacity maps, but these settings have saved me so much tweaking time that it's no problem at all to update a couple of things manually. 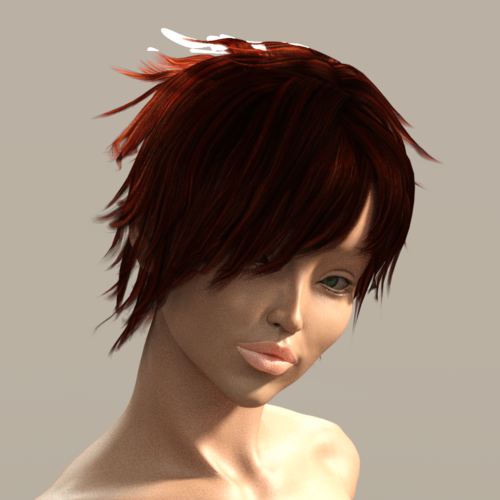 I think this hair (Omri Hair for G2F) came out pretty well, particularly the translucence/backscattering. Settings based on Kamion99's, with modifications. Two versions of Fiora Hair using a custom normal map, and slight variation Kamions99's settings. Thanks a lot. These settings are incredible work very well . Finally someone in this forum deigns to explain in some detail without much theory . Lots and lots of comments with theoretical speculations that does not solve anything .I think this is more technical . Thanks again. Oh wow, this is really making the diffuse maps more useful, thanks! ...used the above parameters (though had to set the Top Coat colour to a light red). Using Scarf Braid Hair and it still looks too "solid" even with the Iray shader, bump maps I made (the hair content doesn't actually have any, just the diffuse and opacity ones), and the bump turned up. Seems I get hair that either looks too wispy or that looks too solid. .
Woot. A mention on fhe main product thread that you can tile maps individually rather than globally ... was the break I needed for established products. What I'm doing now is grabbing a generic hair pattern (the hardis thing linked earlier), putting it into Displacement and Refraction Weight (1), then set horizontal tiling to 16 or something. Now, the overall shape of the hair is defined by the default cutout, BUUUUT... within those shapes, the appearance of fine hairs. I love LAMH and similar for hair, but it can be hard to manage (obj size, extra workflow, extra render time, and if there are multiple figures... ugh). Being able to turn conforming regular hair into something interesting is very important. I'll have my example up in main Iray thread shortly. Here is an updated version of something I posted yesterday. It's mostly using Taigafaeri's settings, except that I turned Top Coat off (it looked strange with this hair), reduced Backscattering Weight to 0.3, and added some anisotropy (Backscattering Anisotropy = 0.13, Glossy Anisotropy Rotations = 0.25). Anyways, I think it's much improved over my previous attempt. Horizontal Tiles is very useful. Trying to learn Iray and ran into this issue with some hairs. Note the extreme white gloss (?) on top. I have tried using and adjusting many of the settings in this thread to no avail. Apparently is the light. That Hair preset works great but sometimes the lights make it look overexposed. I dont know why. Lights with geometry behind go wonky. Its an Iray thing (in the light settings there's a setting to make the emitter invisible but it doesn't work on translucency). I tried to position the lights so they don't end up behind the hair, but some angles it happens. *edit* oops, I did a test and its cutout opacity that's the culprit. I do not understand. Less cutout opacity? Just move the light-set up a little bit. currently the edge of one of the lights is sitting behind the hair and Iray doesn't like that. I guess we aren't allowed to promote available products not in the daz store (ie iRay hair shaders) on the daz forums? I'm a bit out of touch with the etiquette surrouding this. We are not allowed to post links to commercial items or freebies on commercial item pages. Nor ads for one's own commercial products. You can publish a render and say you were using x which is sold over at R or something like that. You can post a link to a freebie available at places such as sharecg.com for example. Unsolicited Off Site Commercial links would routinely be removed. Oh right ... the ST group never did catch on to that so I gave up over there. Maybe put cutout opacity into glossy weight? I suspect what's happening is that the glossiness of the hair is extending beyond where the hair is supposed to be, and the cutout is somehow not applying enough, so you get a sheen off of the shape. Tried that, no effect unfortunately. I think its either a bug or limitation of Iray. I think it's probably related to the issue with backfacing polygons and translucency, which is has also been bugging people in this thread. I get some good results using the Iray shaders from Mec4D Unshaven 2 for Genesis 2 Male(s). The shaders are totally independent from textures. 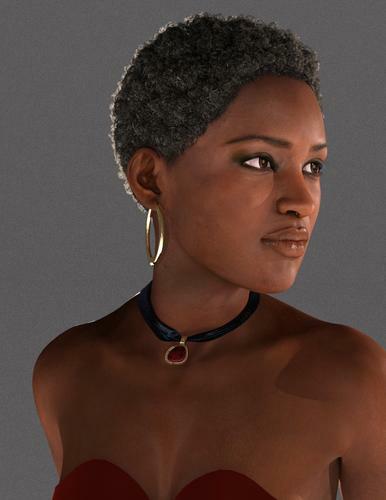 The Iray shaders from Leyton Hair for Genesis 3 Female(s) and Genesis 2 Female(s) by AprilYSH. While they are setup to work with the product textures you can apply it to other hair products pressing Control/Command key to preserve the original texture. It is a good starting point. OOT IrayPair Hair Shaders for DAZ Studio Iray by Outoftouch has a completely different shader setup. It works better on multi-layered hairs and brings a lot of textures to make the work a little bit easier. I my experience, the most beautiful results when using Iray shader comes from the fibermesh hairs. Unfortunately, there are few products using this technology.